excellent replacement drill. Didn't need case, charger, batteries. Nice to be able to get what you need without buying it all. Shipped quick, nuf said. We have a lot of drills on the job. These always get used first. Great power, 3 speeds, locks when you stop. The way it stops when you release the trigger is great. It makes bit changes a snap. It's the best feature. I am buying this to replace one that has been dropped from 15' repeatedly. The old one still works but it has been patched together a few times. This is a great drill... Powerful and Comfortable. I've had this drill for about a year and a half now and can't say enough about it... It has handled everything I have given it and doesn't quit. 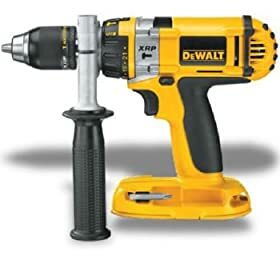 Before buying I shopped at Home Depot and Lowes just to get a feel for the weight, balance, and grip comfort and I can say this drill is tops... It a little loud compared it's competitors, But I love it the way it is, after all it's a "power" tool. My DC988 finally gave out. The gearing broke. It had plenty of hard use for the last 5 or 6 years. But I had collected three batteries and two chargers, so wanted to continue with the same drill. The bare tool replacement was the answer. It came in a few days as promised. The serial number was not readable for some reason. I have no complaints and would order another if needed. I purchased two of these drills and the chuck on one of them has already failed in less than six months. DeWalt tools are a second-tier product at this point. Failure rates are simply too high and parts cost are unreasonable. I recently needed to replace a trigger on a DeWalt 18v drill and the cost was $67.00 just for the trigger, which is three times higher than it should be. On the contrary, my Milwaukee and Bosch tools have functioned wonderfully even in the face of heavy constant use. I had to take apart a small Bosch grinder to change out the brushes and the quality was unbelievably obvious compared to a DeWalt grinder I took apart recently. Update . . . I took the drill back to the US and a DeWalt warranty center repaired it at no charge, but I found out that you cannot just replace the chuck when it fails. You have to replace the entire cone assembly that includes the clutch, speed gears and everything. Moral of the story: Take care of that chuck, keep it lubed because you cannot afford to replace it. I purchased this to replace a similar drill, which I wore out after about 5 years of use. It is an excellent drill. Product was shipped quickly. Excellent service from Amazon, as usual. Dewalt tools are top of the line and this Bare-Tool is a great purchase if you already own a set of batteries and chargers. There aren't many opportunities to get a great drill with a hammer option for under $100. I would recommend this drill to anyone. 3 speed clutch, fairly lightweight, additional handle for superior control, drill or hammerdrill options etc.